Happy Valentine's Week! I hope you all had a great weekend. I'm over on the MarkerPop blog today with a cute card that's perfect for your special Valentine. I'm using the Otterly Adorable set from Mama Elephant. I started by die cutting a frame from some Kraft card stock using the Framed Tags Park Avenue Creative Cuts from Mama Elephant. Then I created a sunset background on a piece of Tim Holtz Distress watercolor paper. I used a mix of Mermaid Lagoon, Tumbled Glass, Squeezed Lemonade and Picked Raspberry Distress Inks. 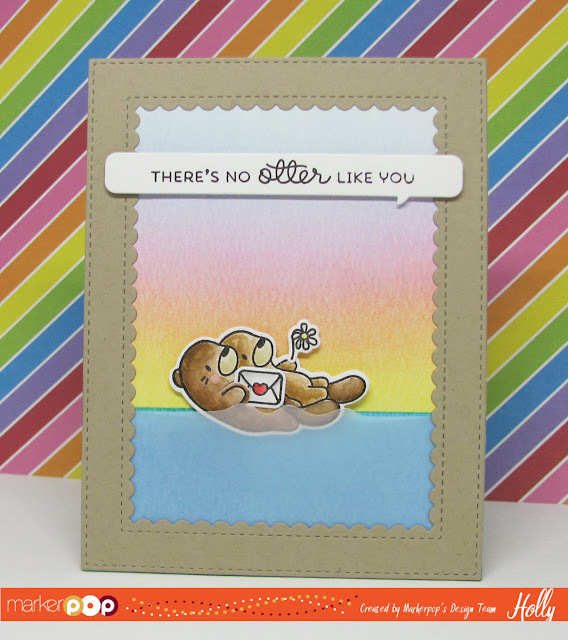 Then I die cut a piece of vellum using the coordinating die in the Otterly Adorable set. I adhered the vellum and the Distress inked panel behind the Frame. Then I added the card front to a top folding A2 size card base. I stamped the images onto a piece of the same Distress watercolor paper using some VersaFine Black ink. Then I colored them in with Distress markers and a small damp paintbrush. I used the following colors: Gathered Twigs, Spun Sugar, Tea Dye, Squeezed Lemonade, Antique Linen, Vintage Photo & Hickory Smoke. I used the coordinating Creative Cuts and die cut the images and then I adhered the Otters behind the vellum with some Foam Adhesive. I die cut the speech bubble from the same Framed Tags Creative Cuts set and stamped the sentiment in VersaFine ink. I adhered it to the card with Foam Tape. This is a really cute set and a must have! !